Help create a great outdoor space for our students! 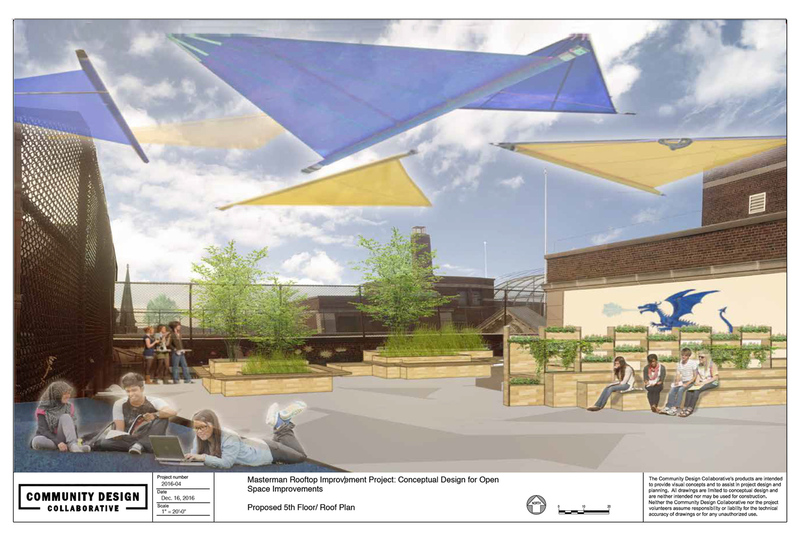 The Rooftop and Open Spaces Project is an ongoing initiative to increase access and provide a range of experiences, both passive and active, in the outdoors for all students at JR Masterman Middle and High School. The benefits of recreation in the open air to our children&apos;s health and well being are well documented. Indeed, the United Nations High Commission for Human Rights listed play as the right of every child and young person. Having achieved our first goals (described at bottom), we applied for the Community Design Collaborative grant to develop a master plan with the aid of design professionals. Starting in spring 2016, a task-force made up of students, parents, teachers, administrators, and community members participated in collaborative workshops with the Collaborative’s team of volunteers to develop next steps for Masterman’s open space. 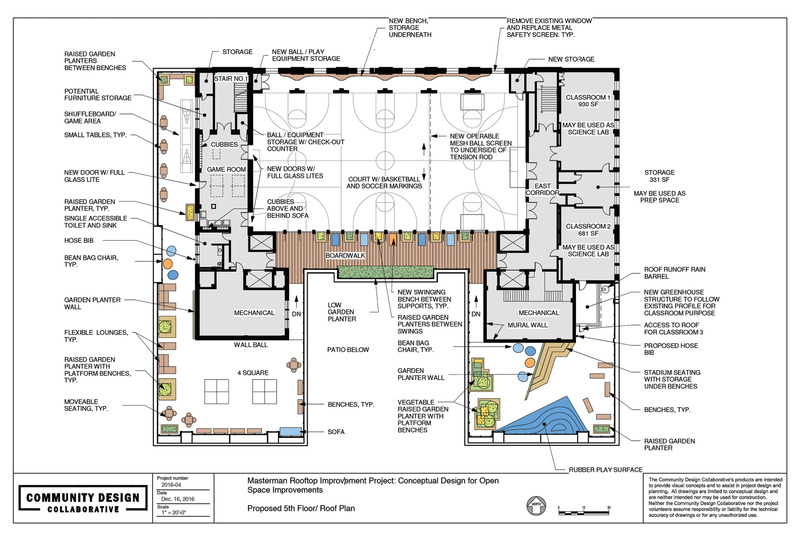 The Conceptual Design for Open Space Improvements represents an exciting vision for the future throughout the Masterman School property. The Collaborative&apos;s grant in-kind services were valued at 40K, and involved architects, landscape designers, engineers and a historical preservationist. 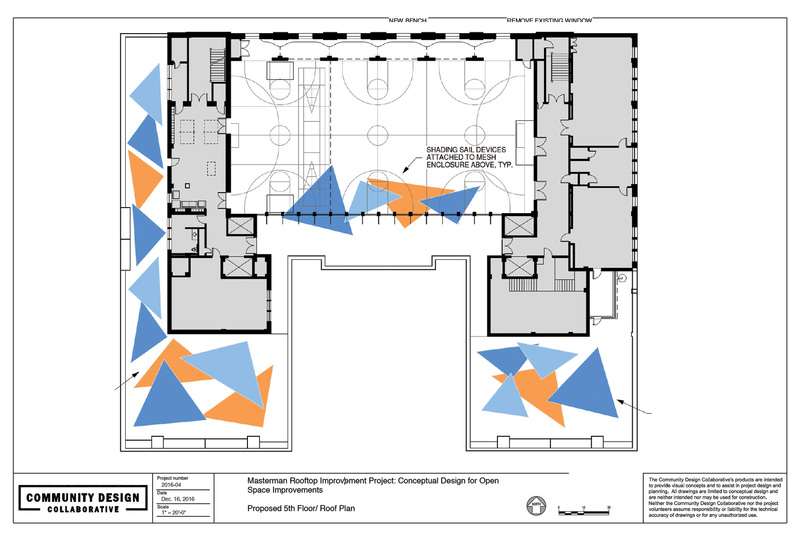 The conceptual design (see below) addresses open space improvements throughout JR Masterman including the rooftop, patio and surrounding perimeter. The report produced by the Collaborative provides the preliminary design and budgets needed to advance to the next step, namely gaining support, raising funds, and implementing the design in phases. Creating a sustainable design involves improvements to existing structures with an eye to expanding functionality, as well as developing areas that are currently not utilized. For example, the basketball court will be resurfaced and a mesh screen ball guard will be installed allowing the space to support multiple activities safely. The whole rooftop will be landscaped, including trees, and a drip irrigation system installed to ensure its sustainability. The game room will be reconfigured to provide more useable space which is particularly important in the winter months. Further the plan includes an outdoor learning space, shade sail implementation and the creation of a boardwalk (see at right and below). Students have been vocal about the need for shade in the hot months. Removable shade-sails would be installed in phases throughout the rooftop as funds become available. Providing shade will extend and enhance the usability of the space year-round, as well as provide protection from the sun&apos;s harmful uv rays. We intend to offer an alternative space for learning that is outside standard classroom walls. Stadium style seating can support classes or casual seating. The greenhouse could enhance the science curriculum and support year-round greening projects throughout the school. Other amenities will include significant greening, including trees, as well as soft contour surfaces for playing and lounging. Boardwalk feature would allow for ADA access throughout the rooftop, an important step in ensuring equal access. Large scale swings will offer a fun and alternative seating option. The space will be interspersed with flowers and plants. In order to make the dream of a fully vital space for our children come true we need your help. Every dollar counts and no contribution is too small. Our goal is to raise $50,000 by February 15th in order to apply for a matching grant that will help us begin to implement the design elements described above. Thus far we have raised over $37,000.00. Each donation will bring us closer to the goal and we thank you for making a commitment to Masterman’s students and bright leaders of tomorrow. If your company offers a matching donation plan please let us know. The Masterman HSA is a 501(c)(3) non-profit organization and any contribution you make is tax deductible. With gratitude, we wish to thank those very generous donors who have already shown support for this significant project that will provide for our current Masterman students and future generations as well! We&apos;ve come a long way! In Spring of 2014 some 75% of the rooftop open space was off limits to students, and they could only access the basketball court and cramped game room with ping pong tables. The outdoor space was barren and uninviting (see first photo below). A couple of parents and a teacher were determined to change this and formed the Rooftop and Open Space Committee. First, a garden club was formed to revitalize what once was a Japanese garden. Next, a proposal for placemaking was developed using simple, low cost interventions, and a Whole Food grant was secured to fund the project. The concept was to offer different zones for socializing and play including: floor seating, soft seating, and benches/tables as well as alternative games to basketball. In 2015 and 2016, with the help of parents, teachers and students, the western side of the rooftop was painted throughout, including two four-square courts, and a variety of furnishings were installed. No longer relegated only to the basketball court, student use of the outside space exploded, and students are now able to enjoy a well deserved break in the fresh air everyday. A school wide survey was conducted to better understand student use of the space, and to determine what improvements would most benefit the students’ experience going forward. We want to build on our early success and continue to develop healthy and dynamic spaces for our students. Have a question? Skills to share? Note: The form DOES work, though does not display a message indicating that (working on it!). We will send an email confirmation.